Why do busy days feel so unproductive? After a crazy busy week the house is a wreck, the kitchen is worse and the laundry is a mile high. This is halfway finished…with the washing, you don’t want to see the folding pile. I actually managed to cook for a change and even made a loaf of bread. Needless to say the rest of the day was a bit discombobulated. The list of ‘To Dos’ is still a mile long….how does that happen? I guess that’s a lesson in just letting the day take you where it will. It’s impossible to stay in control so don’t let the chaos stress you out! We have long been prone to offering our toddler very repetitive foods for mealtime. It’s easy, she eats them most of the time and they’re easy to keep in stock. (Grilled chicken, fresh fruit and veggies, spinach nuggets, oatmeal, raisins, yogurt, apple sauce etc.). So far, we are very lucky we don’t have a picky eater! We have always made an effort to take her out with us and feed her from our plates so she develops a taste for things. As long as she at least tries something, we try not to force her to eat anything she doesn’t want. Of course, at home there is often a game to be played so we do set some rigid requirements around our own dinner table. We are sticklers about eating what you ask for (no wasting food) and we are not afraid to let her “go hungry” if she’s being bratty. Let’s be honest, if she were actually hungry she’d be eating what was in front of her. There are also no toys at the table and we’re working on establishing conversation so there is a small bit of ceremony around the idea of a meal. A recent phase developed of always asking for “something else” when she hadn’t finished what was in front of her. We had been in a habit of giving her one or two food items at a time and when that was finished, we’d move on to the next. Instead, we starting placing small amounts of each food on her plate to start with. If she wants more of something, she has to finish everything on her plate first. We also typically offer a “treat” once the meal is over, this usually happens to be an “ice yogurt” (a yogurt tube thrown in the freezer). If she doesn’t clean her plate, that’s fine, but she knows there’s no “treat” later. Other special treats have been smoothies, apple sauce or other foods we might not always have available. Variety seems key here as an incentive! There are still plenty of food battles but those are the guidelines we try to live by. Consistency has always been our friend though at times, it’s so difficult not to give in! Lately, we’ve been trying to eat more often as a family. This is far more likely on weekends when one or both of us is home to cook (aka one cooks and one plays defense with the baby walker). With the babe heading towards one year, finger foods are a new source of frustration. So far, breads, grilled chicken, Cheerios and fruit are a hit. I refuse to start making three separate meals so baby Maggie is getting some major food exposure much more quickly than her sister ever did. She also has a cookbook! I tend to be more of an online girl myself, but that doesn’t always work for everyone! PS: You’d laugh if you could see my “office” space today…I have to show you. At least I have tea and a view? Getting a Toddler to Stay in Bed! I’ve been doing a lot of research lately because our three-year-old likes to pop out of bed as soon as she hears the tiniest of sounds in the morning (aka my 5:20 alarm so I have 30 minutes of alone time to exercise). Needless to say, this has undesirable consequences for everyone. The thing is, when she gets up early (or at her much later wake up time if 6 am) she is fully prepared to face the day with a smile. She gets a decent afternoon nap and is in bed by 7:00 – 7:30 pm most nights. Her routine has been pretty fixed for a while and I am not ready to give up a daytime nap, nor do I think she’s ready. So, the only solution I can see is to push back her bedtime. There have certainly been times where she has gone to bed much later than that and still risen with the dawn. However, we have never made it a consistent switch. I’m not sure I’m prepared for the emotional warfare that will commence if she’s overtired and cranky. But 5:20? Really?? Why won’t she just stay in bed? So we will attempt to slowly move back her bedtime and see what that brings. Are we crazy? We shall see! 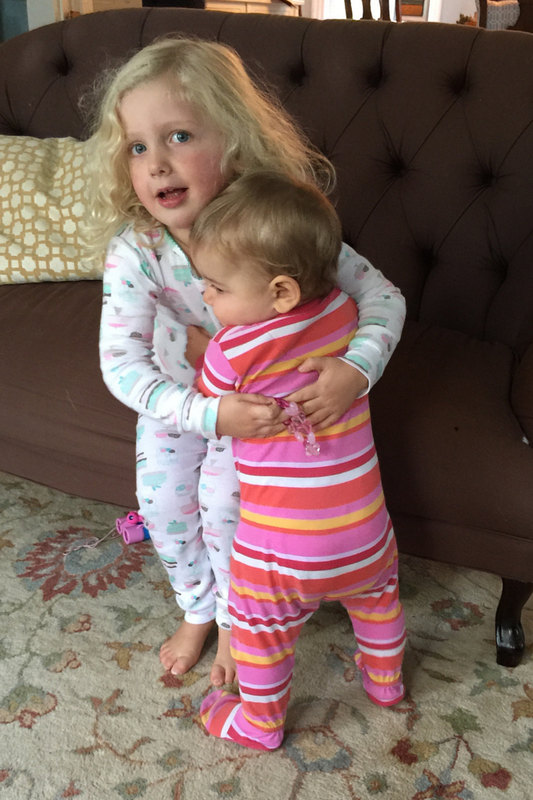 Toddler Discipline as we know it, year three. Discipline has been an evolving process since our oldest was born. It’s difficult to remember the early days but we tend to have headstrong kids who aren’t afraid to make their wishes known. Case and point, the little one is getting braver by the second and responds to the word “No!” with a wail of protest. She still complies, for the next five seconds at least. We always try to follow the ideals of positive reinforcement, pointing out the good things in hopes of encouraging more good behavior. Harping on the “bad” behavior often begets more of the same as even negative attention in a busy household is attention focused on that child. Kids know how to push our buttons so when I start getting my words parroted back to me before I even say them, I know it’s time to change my strategy. That said, many of the tactics we use don’t always prove effective when dealing with toddler discipline. Incentives and rewards are often shrugged aside when a stubborn three-year-old has her nose out of joint about something or other. Praise and encouragement only go so far when she has her little heart set on the sequence of events happening as she sees them. More often than not, communication is the root of many of our difficulties. It’s not easy for a precocious three-year-old to understand parent imposed limits, timeframes or obligations like work. Sometimes, after attempting to satisfy an endless stream of “Why, mommy?”, “Because I said so!” is the only answer left. If you take a step back and try to view our hectic lives from a child’s point of view it’s easy to see why they balk when we try to hurry, or resist when we try to cajole. Their needs and wants are simple…love, attention, a full belly and some good old fashioned fun. So as I grind my teeth in frustration after the millionth challenge of the day, I try to put myself in her shoes and find a little more patience. I’ll try to pick my battles and save them for the big ticket items I really care about…manners, kindness and gratitude being at the top of that list. What are your tried and true best practices for discipline? I’d love to add to my repertoire! It’s amazing how kids follow patterns even when you don’t realize it. I just read back through a few old posts and came to realize that we had much the same experience with Lena as we’re having with Maggie. We are battling teething, a growth spurt AND a cold which are all contributing to night time wakings. I’m not talking a little blip and back to bed. This child is roaring for food and nothing will calm her except an 8 ounce ( yes, you read that correctly) bottle. That’s after being sent to bed with 10 oz to start with! I’ve finally whittled down the process to roughly 40 minutes but it’s still a huge disruption when I’m sleep deprived myself. The good news is, after many days of swollen gums, we are finally seeing evidence of three teeth breaking through and most likely one more soon to follow. They can’t appear fast enough for me. Maybe once they arrive we’ll have a chance at a relatively quiet night? We are currently employing the “grin and bear it” brand of coping. Ibuprofen before bed doesn’t seem to make a bit of difference. The only soother is more food, only then do we have a chance at a slightly less cranky baby. In the midst of all the social media and environmental pressures kids are up against, I want mine to understand that it’s more important to be an individual than to fit a mold. Weight is just a number, not a defining characteristic. Confidence is infinitely more attractive than thigh gap (I mean, really!). Self worth is a far more apt measure of your future success than what brands you wear. Drive and determination are pillars of success, not lack of failure. That just means you might not be trying hard enough! I was a tom-boy, when I was little I was daddy’s little helper, I chopped wood to get in shape for softball season, I climbed trees and built forts with my brothers. I wore a uniform until 8th grade and didn’t care much about fashion or trends. To this day I hate shopping for myself, “tall” and “long” sizes didn’t exist so I constantly waged a battle between baggy clothes or too-short pants and sleeves. If my nose wasn’t stuck in a book I was probably playing sports, tinkering with the computer or inventing a new adventure with my brothers. My parents managed to raise me in such a way that I never felt compelled to follow the crowd. I was OK with being a little different and even relished the fact. I had my ups and many, many downs just like any kid. I’m petrified at the idea of raising two girls in this media centric world where the values that are held as the norm couldn’t be farther from the truth. I want to wrap them up and let them evolve free of unrealistic expectations (even my own?). But I realize that I can’t protect them from everything. Often times, their lives will be the richer for the things they experience outside the safe little bubble we try to build for them. One day, I might even learn to accept that fact. Our mission, as I see it, is to give them the tools to achieve their dreams and to empower them to live happy, healthy and enriched lives whatever paths they choose. To do that we must bring to life those hopes we have for them and model those behaviors we feel are most essential. Live the characteristics you want to see in the world and you can’t help but raise self confident kids! Inspired by family and friends, I finally feel like I’m actively working to embody those goals and I’m going to try my hardest to enable my kids to do the same. So here’s to pursuing your dreams, being an individual, finding your healthy and above all… being fulfilled and happy.